Welcome to Episode #29 of the Living Homegrown Podcast! Fall is upon us and everyone has apples! In this episode I answer a question from a listener about my favorite ways to preserve large batches of apples. Listen in for ALL the details or read the transcript below. 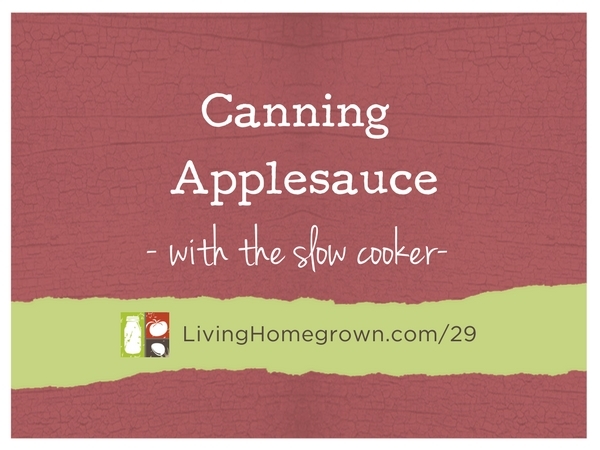 Have you made applesauce using a slow cooker before? I tried your crockpot recipe and I processed the jars. However, the apple sauce was full of bubbles after processing even though I had removed the bubbles before processing. I wasn’t sure if the apple sauce would be safe to eat so I opened my jars and froze the apple sauce instead. How can we make sure that there are no bubbles in the apple sauce after processing? I’m so sorry you had to go through opening all the jars. Those jars were okay! All thick products like applesauce get bubbles lodged inside the product during processing. It happens because the contents come to a boil while inside the canner. The bubbles are harmless. Where you need to be careful is if the bubbles start to become active days or weeks later after the jar has been sitting on the shelf. By active, I mean that NEW bubbles are forming and moving inside the jar. That would be a sign of fermentation. If you are ever worried about seeing bubbles, do this: Make sure the jar is completely cooled and it has been several days since you processed it. All jars can have bubbles dislodge and rise to the top for about 48 hours after processing. But it takes many more days to weeks for a fermentation to start. So to check, you would set the cooled jar on the table (48 hours after processing) and leave it undisturbed for an hour or so. (moving the jar can cause a bubble to dislodge). Then, come back and watch the jar. Do you see movement? Are the bubbles forming and rising? THAT would be sign of fermentation and it would be at that point that I would throw out the contents of the jar. But if the bubbles embedded in the applesauce are NOT moving, then they were just there from the processing. Keep in mind that over the first 48 hours, some of the bubbles from processing CAN rise up to the top. But it takes much longer than that for fermentation to start. That is why I say to check the jars many days or weeks after processing to look for movement. All movement of processing bubbles should be gone by then. Also, if you store the jars properly (without the rings on) any fermentation would cause your seal to break. The fermentation would build up pressure inside the jar and cause the lid to pop off. That is why we remove the rings – to alert us that there was a problem in the jar. So if you do this again, just know that bubbles right after processing is normal. And having some bubbles weeks later is normal. What is NOT normal or safe is ACTIVE bubbles – new bubbles moving inside the jar or (if you leave the rings on) any jars with a bulging lid. Those are all signs of fermentation and should be thrown out. Thanks for your very clear reply. This should be part of every canning book because they just put the “fear of bubbles” into us.